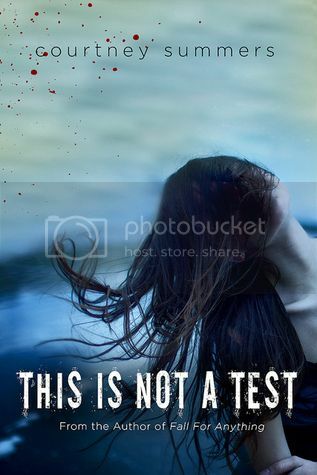 This is Not a Test by Courtney Summers is book #3 in my Halloween Reads Week! This is another book that I have wanted to read for a while now, and I’m super glad I finally decided to read it this Halloween. It made a perfect addition creepy Halloween reading list. To be honest, I’m not a big fan of zombies. You’ll never catch me voluntarily watching The Walking Dead or anything like that. I can take them, in moderation, and that’s exactly what we get in this book. While they are around, and the times we do see them are freaking intense, they aren’t the main focus of the story. I enjoyed that about the book, I think it made it the book a lot easier for me to read. The main character in the story is Sloane. Wow, this character is seriously messed up. After years of abuse from her father, and being left by her older sister who promised to always take care of her… it’s easy to say she has some serious issues. You totally feel her emotions when reading the pages. She wants nothing more than to give up on life, and so different than what I am used to reading in a main character. You couldn’t help but feel sorry for her situation. The way that she interacts with the secondary characters, who are all hoping to survive, you can just fell her despair and detachment. Overall; I had heard this book was pretty great, and I’m seriously kicking myself for not reading it sooner. It has a major creep factor going on, which made it yet another awesome Halloween Read! I am not a big zombie fan either. I do like the sound of the six who are trying to survive and what they'll do to survive. That sounds like the part of the story that would keep me reading more. I love this book! I think it's my favourite Courtney Summers book. I also love reading about zombies, so this was totally up my alley, but I'm happy it's still a good read for people who aren't into that!